Step 1. Hold a standard 10-inch piece of dry (uncooked) spaghetti by both ends and try to break it into just two equal-sized pieces. Step 2. Post your successes and failures to social media. Step 3. 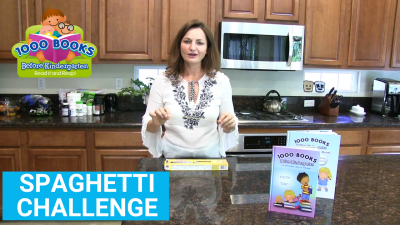 For every piece the spaghetti breaks into, consider donating $5.00 to 1000 Books Before Kindergarten, https://1000booksbeforekindergarten.org/donate/ a national organization with early literacy programs in libraries across the country dedicated to improving childhood literary. Step 4. Have fun challenging your friends!